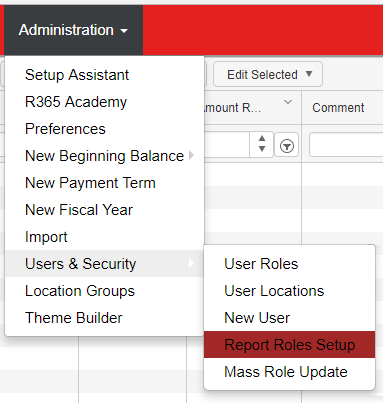 Navigate to the Report Roles Setup screen to Create and View Report Roles. Hover over the 'Administration' menu in the Top Ribbon, then hover over the 'Users &amp; Security' sub-menu and select 'Report Roles Setup'. 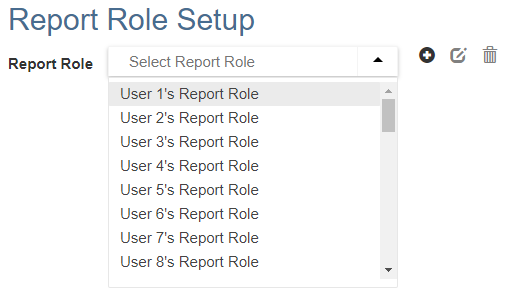 The Report Roles Setup page will load in a new tab. For Users that started using Restaurant365 prior to September 2017, Report Roles were generated for each individual User based on the legacy 'Report Favorites' and 'Report Defaults' settings for each User. These legacy report settings have been replaced with Report Roles as of September 2017. Generated User Roles can be renamed, edited, or even deleted. Note: if a generated Report Role is deleted, the User for which it was generated will need a new Report Role assigned to their User Record in order to view and run any Reports. Click the button to create a new Report Role. Enter the Report Role Name in the 'New Report Role' prompt, then click to save the role and view the Report Picker. Two sections will appear: 'Not Available to Report Role', and 'Available to Report Role'. Each section has a 'Name' and a 'Category' column. 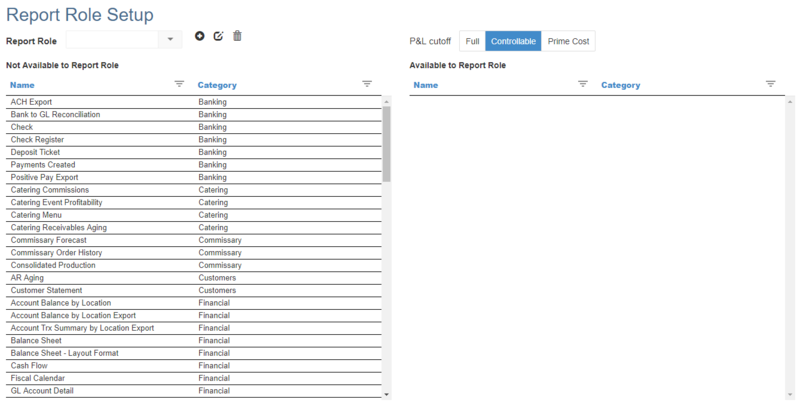 Each column also contains a filter that be used to filter by category, or search for a specific report title. Select a Report Role in the Report Role Selector, and make any Report changes. Changes are Saved automatically.